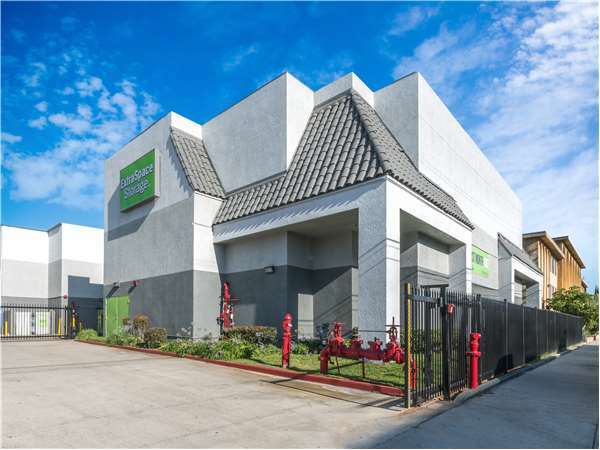 Located on Roselle Ave near the intersection of W El Segundo Blvd and Prairie Ave, Extra Space Storage serves residents of Hawthorne, West Athens, El Camino Village, and more. Locals will recognize our facility behind Burger King and El Rancho Inn across from Hawthorne Memorial Center. Extra Space Storage on Roselle Ave offers a wide range of storage units, drive-up access, and exceptional security! We can accommodate both residential and commercial storage needs in Hawthorne! Store items of all sizes with ease at our Hawthorne storage facility! We have unit sizes from 4x4 to 10x30 with features like indoor access, drive-up access, and more for your convenience. At Extra Space Storage, security is a top priority. Our Roselle Ave storage facility has an on-site resident manager, 24-hour video surveillance, and electronic gate access to keep your items secure at all times. Save time and energy with drive-up access! This amenity allows you to pull a vehicle up to your unit to unload and load items without hassle. Drive-up units are available in sizes 5x10 to 10x30. With a well-maintained, secure, clean facility backed by a friendly, professional staff, you know you're getting the best at Extra Space Storage! We genuinely care about providing our customers with great service and dependable self storage. Contact us today to reserve a storage unit in Hawthorne! The rep (Omar?) was really honest and helpful with us. He didn't try to be a cheesy sales rep and sell us something we didn't need. He was straightforward and got us exactly what we needed. Good guy! I will love people to know if they are looking for a storage to rent they should look for extra storage thank you. If you are looking for a place to store your life while you are in transition, look no further. I went to a couple of storage units and researched many before choosing extra space storage. The customer service was excellent. Great customers service from the guy at the office that gave me a unit at a good price to put all my things in that I needed to put in before my trip to Alaska. The facility is cheaply constructed, could've @ least had insulation and some cheap roof ventilation fans, and if they do have em that ain't worth crap. The 3rd floor, which is the top floor has no ventilation and the temperature gets very hot, especially in the summer. High temperatures in that building could damge stored items. Plywood floors that crack when you roll a cart with heavy items on it. Will be moving in the near future, and wouldn't recommend that location even if the prices are a lil better than other extra space storages. The site manager is nice, and helpful, but all of the issues are beyond her control. I searched around and compared prices and ultimately settled on ESS. They offered the best and most competitive prices, their facilities are large, open and always clean and well kept. Moreover, the staff is always generous and willing to help. Excellent customer service, very helpful. Made me feel more comfortable when moving is very stressful. Thank you Melody at the Hawthorne Location! You have made things for me easy at stressful time and my mind is at ease knowing my belongings are secure. This facility has great customer service. Sateen was very friendly and knowledgeable about the facility, insurance and rental process. Highly recommended! I have been with extra space storage for a couple of years now & as a business owner my equipment is in very good hands. I love the fact that when you have an issue or problem they help out right away, complaints get addressed in a timely manner, they go the extra mile to satisfying your needs, i could not recommend anyone else when it comes to storage needs. Great affordable prices, do not hesitate to try them out. My experiece with Extra Space Storage is wonderful, the service is fast and the place is clean. This is my first storage and I chosed Extra Space Storage I believe I made a good decision going with them. Wonderful staff...pleasant and very professional! Ieshia and Adam are a dream team. Aiesha was a great rep for my space as well as all of the other reps. The experience with them has changed my life. That location has great deals but the people working there made all the difference. Adam (aka Freddie prince Junior because he could be his twin brother) is very professional and helpful. He will do everything in his power to find a solution to any of your needs. I was very impressed by him and Aisha who is the manager. I highly recommend this Extra Storage location. You will not be disappointed once you talk to either Adam or Aisha, they will take good care of you. This facility has easy access and good gate hours. The managers are friendly and live on the premises for added security. We have been with Extra Space Storage for the last 3 months and we've experienced great, friendly cutomer service. Storage area's were clean and well lit up.I also think that the staff here has been a great help beacause they have assisted me in getting equitment to move my stuff, such as carts and dollies. I have been with this facility for 10+ years and the customer service is always above average. There is never a time that I have come to my storage space that there is a sign of inexperience like Uhaul. They are very knowledgeable and when I became unemployed they were looking out for me and showed me a way that I could save on my storage fees. I thank Ieesha and Carolyn for their expertise as caring individuals. It is a pleasure to know that when i have to go to my unit if i need anything or have any questions i will be helped. i am always greeted with smiles and kind words. They care about you and your space being safe. The clean facility is a place to store your valuables. Traveling from 105 exit at Prairie Ave and travel South to El Segundo Blvd. Making a left at El Segundo, immediately getting into the right hand lane to turn right onto Roselle. Our parking lot entrance is the second driveway, located next door to Burger King. Traveling North on 405 you will use the El Segundo Blvd offramp making a left onto La Cienega Blvd and then another left onto El Segundo Blvd, going under the freeway overpass. You will find our property located across the street from Memorial Park, behind the Burger King on Roselle. Our parking lot entrance is the second driveway, located next door to Burger King. Traveling the 110 - you will head West onto El Segundo Blvd. After passing Crenshaw Boulevard, look for Roselle Ave. You will find our property located across the street from Memorial Park, behind the Burger King on Roselle. Our parking lot entrance is the second driveway, located next door to Burger King. Traveling South on the 405 you will use the El Segundo Blvd off ramp. Passing La Cienega Blvd and going under the freeway overpass you will travel down El Segundo just past Prairie Ave. You will find our property located across the street from Memorial Park, behind the Burger King on Roselle. Our parking lot entrance is the second driveway, located next door to Burger King.